The current theory to how it works is - AM/FM Radio scanner that continuously sweeps through radio frequency's, with the ability to change sweeping speed which allows you to allow more radio frequency segments or less depending on your choice. Its believed that spirits/ghosts can use this device very easily, its claimed to be telephone to the spirit-world. Apparently spirits/ghosts can manipulate the device within the white noise and talk to us creating a very loud EVP session in real time. Before the hate gets thrown at me in great mass by the ghost box addicts, I prior to this hypnosis of the spirit box have used the box for 3 years in well over 30 investigations before creating this theory. Although i was always a sceptic to what is a ghost voice and what is radio, there was responses through the spirit box that blew my mind, Even to this day they stick in my mind. I tested out the box on every setting possible and my favourite settings were - FM, Rev Sweep , 150Ms.... My opinion is that this made radio hard to come through Audio-able enough and for a voice to sound more obvious. Its claimed it gives energy in the investigation for the ghosts to absorb and communicate , my belief is that all energy felt from the spirit box session is all very normal and that is due to listening to frequency's at a extremely high db. 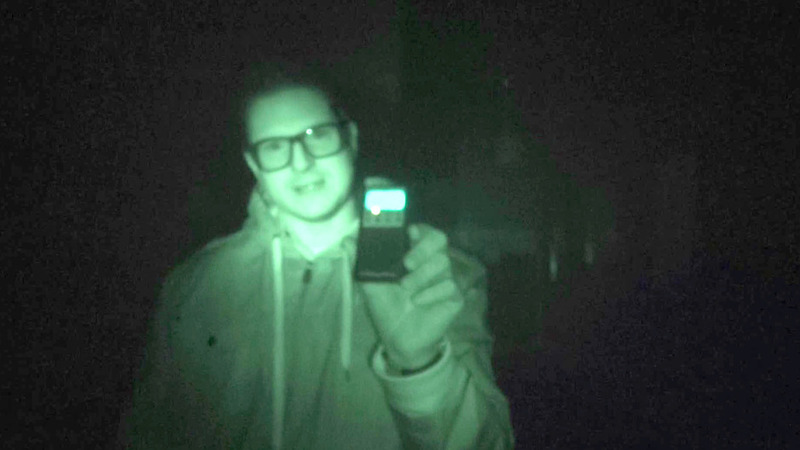 There seems to be very little scepticism about the device from paranormal teams out there - 9 out of 10 videos on youtube will have spirit box being used. Often they use phases like : AMAZING RESULTS , INTELLIGENT RESPONSES , EVIDENCE..... Which sounds great but the result is not factual, its random sounds we are creating to be intelligent responses - the response you get through the spirit box is only intelligent as your brain , using paridollia you create unwillingly the result that you think is amazing. It is not evidence when its not scientific and although using forced information and paridollia it does indeed seem to be what is claimed but when your hearing the voice with no information your brain will take different random information and create a different response or be able to determine it is paridollia easier. For years i listened to the spirit box and know the sounds very well it produces where before i would assume it was a voice due to paridollia i now can hear its radio frequency's and noise creating information what is not actually there. The spirit box is an entertainment product which is full of audio contamination (even if the theories were correct), people say ‘I removed the antenna and got voices it cant be radio’ - nobody uses a spirit box without plug-in speaker and once that jack goes in the spirit box it creates a new antenna. Major white noise does not help EVPs (1st failure) , Radio signals is always going to produce false results and paridollia (2nd failure) , the original concept is nowhere near fool proof (as we cant design what we dont know - ghosts have never been measured or questioned under scientific standards), lots of assumptions of how it works instead of factual information (3rd failure). The issue does not come with the voices coming through its proving they are actually a genuine spirit voice like EVP or its random and our brains are just trying to make sense of it. Everyone who uses spirit box say's "Amazing Results" there is a reason - your information is fitting into the random sounds that you are hearing.....The best way to have level of validation with a voice - do NOT research anything about the history about the location at all, see what voices come through, if something comes through and then when you research and come across that name you might have something credible. If there is a shred of doubt in your results , scrap it with the paranormal it has to be provable. The spirit box is not a "tool" to be used in any serious investigation, i can understand why ghost hunting events company’s use them (to entertain) but it is something that can never be proved in any way to be contact from the other-side, there is too many contaminates within the frequency spectrum to taint the authentication of the results. Trying to look into new ways of communicating with spirits is not the right process at this stage, we are still non the wiser to knowing what it is, advanced technology is ahead of its time and has no baring on an investigation. Just document what you see and what you hear, and if you do hear or see anything there is a major chance that the camera or recorder also captured this. The existence of spirit box for the humans is exaggerated and elevated for the benefits and advantages. The spirit box is for the sympathy of the visits of http://www.writemyessaypaperss.com/ for information and inculcation of the new ideas. I'm always documenting such things! It is our memory! And http://www.intimeessay.com helps me to make posts after! I am an avid lover of these paranormal activities. I used to watch these documentaries made by parapsychologists. Initially, it was out of fun and later on, I got serious about it. I do believe that there are ghosts and invisible forces residing with us. Hey Zak I proved it to be spirits by asking them what setings should I set higher or lower. They would all tell me to turn up noise sensativity literally. And radio speed or sensativity and it works better. Please test this. Some of the spirits tried to make serious vocalizations from the skipping sounds. I purposely turned it down and they all freaked out and said turn up sensativity noise sensativity up up up good.